Details Released for Kiryu /Royz /Codomo Dragon Collaborative single "FAMILY PARTY"
B.P.Records is dishing out a new surprise for their bands' fans. On November 25th, Kiryu, Royz and Codomo Dragon will be releasing a collaborative single "FAMILY PARTY". 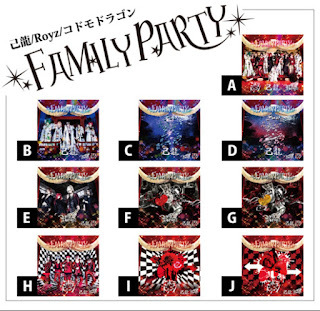 "FAMILY PARTY" will be sold in 10 different editions. TYPE A will feature the collaborative single, "Ryouran Resonance" while the remaining 9 editions will separate the three different band's songs. TYPES A, B, E and H will be 1800 yen. 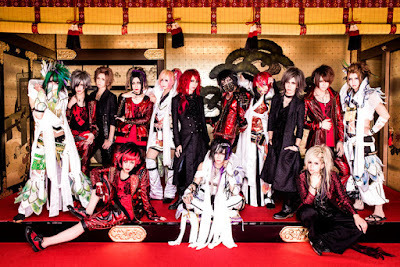 The remaining singles will be 1500 yen each. For those curious enough to see what this huge single will be like, previews for the featured singles have been released.